The ISKCON-London Radha-Krishna Temple is a spiritual oasis in the heart of London. We are devoted to sharing the timeless culture and practices of bhakti-yoga from the great spiritual teacher, His Divine Grace A.C. Bhaktivedanta Swami Prabhupada, who first brought the culture of bhakti to the Western world in 1965. We welcome everyone on their spiritual path to join us in our vibrant daily activities and events. Originally located, since 1969, at Bury Place, opposite the British Museum, the Temple moved in 1977 to its current location at 10 Soho Street. Popularly known as the "Hare Krishna's", we are a worldwide organisation officially called ISKCON (the International Society for Krishna Consciousness). ISKCON is a bhakti-yoga tradition sitting on the Gaudiya Vaishnava "branch" of the Hindu "tree". Today, ISKCON comprises of 500 major centres, temples and rural communities, hundreds of vegetarian restaurants, thousands of local meeting groups and community food relief programmes, and millions of members on every continent and in every major city in the world. The ISKCON-London Radha-Krishna Temple has wholeheartedly invested in serving and sharing our resources with the London community for nearly 50 years. We are a UK registered charity (Charity number: 1132794). There are also more than 15 ISKCON centres across the UK including our national headquarters at Bhaktivedanta Manor in Hertfordshire. Find a centre near you. Daily, we offer a variety of activities and services to our community. Our centres are always looking for ways to find sustainable systems for world and individual ecology. Creating eco-villages and farm communities has been a part of our Founder's mission and is on ISKCON-London's agenda to fulfil. Internationally, ISKCON has 65 such sustainable communities. We believe mankind's responsibility is not limited to solely humanity but also to all life forms, especially animals. We therefore do not support the killing of animals for any purposes. The cow is considered to be favoured by Lord Krishna Himself and our vision is to aid the world in creating ahimsa (non-violence) farms and dairies where cows (and all animals) are allowed to live out their lives and be treated with respect. Both mental well-being and physical health is of upmost importance to us and is based on our philosophy of "simple living and high thinking". Our aim is to educate and enliven others on how to live a holistic lifestyle. Our centre's owned-and-operated Govinda's Restaurant is a pure vegetarian restaurant which has been in London since 1979. ISKCON's heritage is rooted in the ancient Vedic culture of India that is a plethora of wisdom in the arts, music, dance, cuisine and literature. This culture puts significance to the meaning and emotions behind artistic expression, and is intertwined with its philosophical underpinnings of devotion to God. Cultural showcases are presented at all our major events and festivals, and devotional expression is encouraged as a lifestyle. 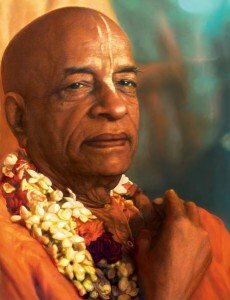 ISKCON was founded in 1966 in New York by His Divine Grace A.C. Bhaktivedanta Swami Prabhupada, affectionately known as Srila Prabhupada by his followers. With great effort and determination, at the age of 69 (when most people are retired), he journeyed from Kolkata to New York by cargo ship hoping to help the people of the Western world to reconnect with their spiritual essence. He sought to pass on the ancient teachings of bhakti-yoga and demonstrated how to practically apply this knowledge to live a happy and fulfilling life. Srila Prabhupada has unlocked the secrets and sacred spiritual knowledge in the Vedic tradition and made them accessible to everyone. His "Bhagavad-Gita As It Is" is the largest selling edition of the Bhagavad-Gita in the Western world and translated in over 76 languages. We are open every day of the year, with daily activities running from early morning until late evening. Join us for colourful worship ceremonies, healthy "karma-free" cuisine, daily meditation, talks and seminars; or pop into our boutique for spiritual books, health and well-being products, music and more. Yoga is more than just a physical exercise. The word "yoga" comes from the Sanskrit root, Yuj, which means to link up with or combine. The word "bhakti" is derived from the Sanskrit word, bhaj, which means loving service. Bhakti-yoga means to connect to the Supreme by means of loving devotional service. Today, some yoga practitioners consider the physical benefits of yoga to be the end in themselves. But according to the traditional yoga systems, physical exercises are just one step on the path of God realisation. The Bhagavad-Gita (the core spiritual text of the Hare Krishna movement) explains bhakti-yoga (the path of dedication and love) as the culmination of other yoga practices. Bhakti-yoga focuses on developing our dedication, service and love for the divine Lord Krishna. The lifestyle of a bhakti-yogi is one of intentional actions and choices that are in favour of becoming conscious of the Supreme. Through a variety of activities, a bhakti-yogi aims to become a devotee of the Lord, training the mind along with our actions towards selfless service to all living beings and ultimately to Lord Krishna. Living in this way, we reduce our karmic reaction because our daily activities are intentionally devoted to the divine who is the controller of karma. Some of the activities we do daily are: meditate, sing mantra music, study and live by the sacred Vedic wisdom, have daily philosophy discourses, eat only karma-free vegetarian food, and try in all spheres of our life to live in a way that upholds the principles of truthfulness, mercy, austerity, and cleanliness. The Vaishnava tradition recommends the chanting of the names of God to be a particularly effective method of spiritual awakening, simultaneously opening us to an incredibly empowering experience. Bhakti-yogis use mantra meditation both on an individual level and collectively through mantra music and singing called "kirtan". We believe that the sourcing, preparation and eating of food should be based on principles of compassion, non-violence and balanced living. Thus, bhakti-yogis advocate a strict vegetarian diet, avoiding any animal products. In the Bhagavad-Gita, Lord Krishna tells His friend and disciple, Arjuna, to offer everything to Him and in this way everything he does, thinks, and eats becomes freed from sinful reactions, or karma. In Sanskrit, this is called "prasadam", which means mercy. This is sanctified food that has been offered to Krishna with love and devotion. Our food distribution programme, Food For Life, gives out freshly-made hot vegetarian food (prasadam) on Mondays to Saturdays at various locations in London. Our branch in London is part of the Food For Life Global charity that combats hunger and crisis relief by serving two million free meals a day, internationally. Find out more at www.ffl.org. Our London College of Vedic Studies, based at our ISKCON-London centre, holds regular adult educational courses with an emphasis on moral education and vocational training in specific topics such as healthy lifestyle, cooking, music, and personal development. We also have free daily discourses and taster ses­sions on philosophy, meditation and yoga which is open to all. Our centre holds annually more than 10 large public festivals with more than 1,200 participants, and more than 20,000 participants during our annual summer Rathayatra procession at Trafalgar Square. We have daily street processions where we distribute books providing spiritual knowledge and invite the public to our centre through lively music and dance. We also annually distribute more than 60,000 books to the public.We are a lifeline for cosmopolitian London - our centre provides a quiet place to spend time, connect with others and have a warm meal. Volunteers are an integral part of ISKCON-London. We have more than 300 volunteers who contribute to the day-to-day running of the Temple, organisation of events, festivals, courses, cultural showcases and all of our out­reach work. Volunteering, or "seva" in Sanskrit, is fundamental to one's emotional and spiritual health. Our volunteers are given full access to hands-on work and leadership roles, and are taken care of as individuals in a dynamic and lively environment.